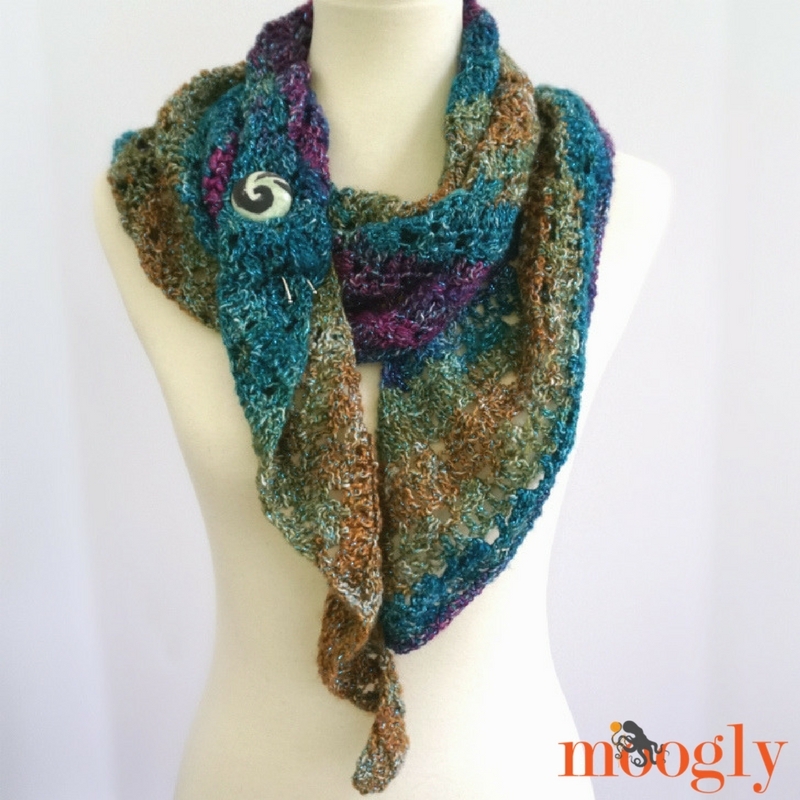 Tango Shawl - Free One Skein #Crochet Pattern on Moogly! 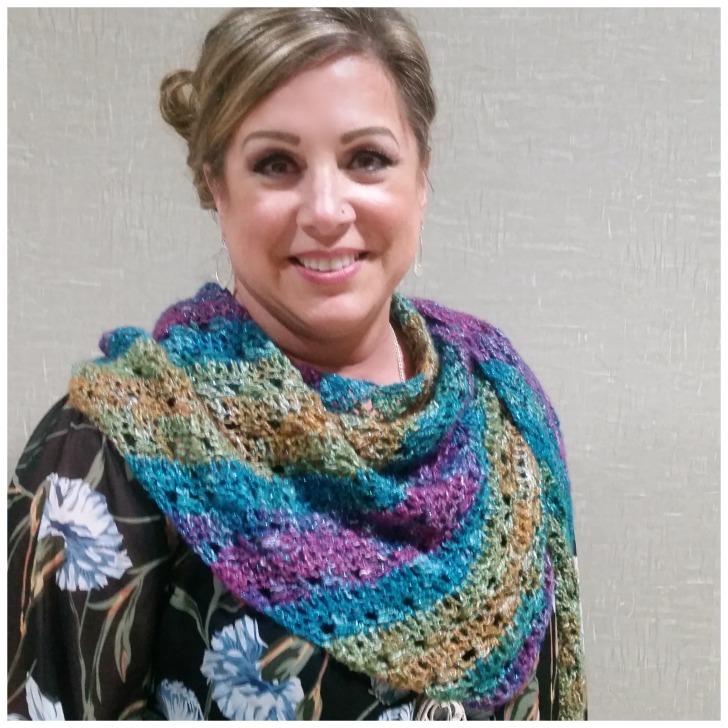 I designed and crocheted the Tango Shawl while at the CGOA Chainlink conference this year – surrounded by all the lovely crochet, there was so much inspiration! And I got a unique opportunity to have some special models that you just might know too! 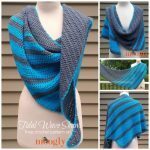 Disclaimer: This post includes affiliate links; materials provided by Lion Brand and Furls Crochet. The Tango Shawl is made with an easy four row repeat, in an asymmetrical style – and when you’re done, you’re done. No borders! It’s a perfect one skein project. But as fun as asymmetrical shawls are to make – how do you wear them? It’s a question I’ve heard several times, so I decided to ask some very special friends to show me how *they* would wear it! In fact, that’s how it got the name “Tango Shawl” – it had a few of them dancing as they tried it on! Some of the photos are a little blurry – shooting in a hotel lobby with a cell phone isn’t the best – but I hope they give you some great ideas! And I’ve linked their blogs for you to check out too! Pia Thadani of Stitches ‘N’ Scraps! Pia wins the bravery award for going first! 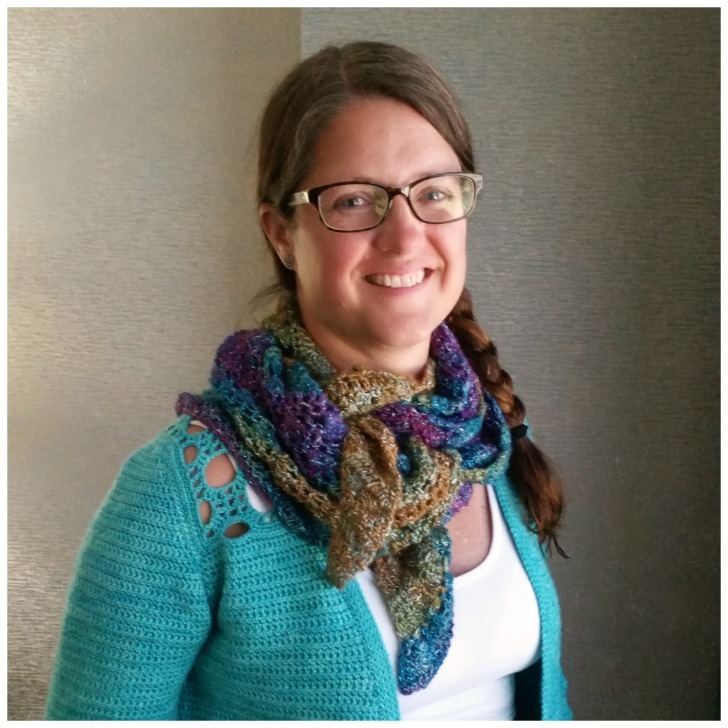 Laurinda Reddig of ReCrochetions and Ficstitches Yarns! Blurry photo because we were laughing so hard! Kathy Lashley of ELK Studio! Who thinks we need to have a meet and greet with all these amazing designers next year? Elena Hunt of Beatrice Ryan Designs! She’s decorating a new condo right now – lots of fab patterns to share! 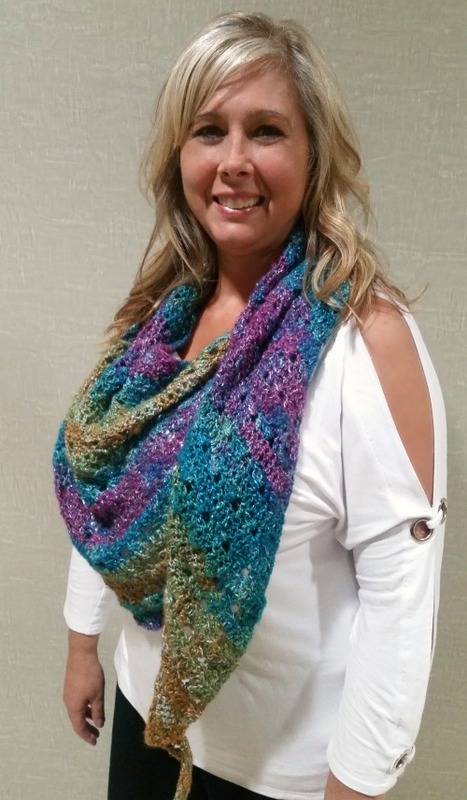 Jennifer Pionk of A Crocheted Simplicity! I so enjoyed getting to know Jennifer better this year – and seeing her work in person! Andee Graves of Mamas2Hands! Andee even wore a matching skirt – and shows off her summer and winter looks! Julie Desjardins of ACCROchet! My very favorite Québécois designer! Shira Blumenthal from Lion Brand! 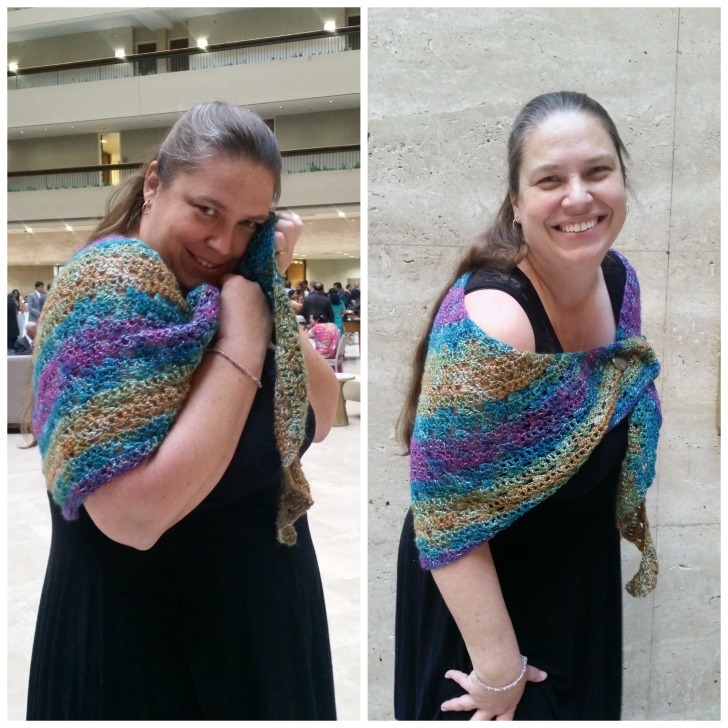 Okay, so the shawl wasn’t quite done, and we totally took this photo outside the elevator at about 10pm, but she was such a good sport, and how could I pass up this opportunity! Thanks Shira! 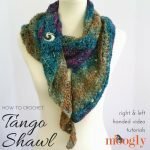 So as you can see, there are lots of ways to wear the Tango Shawl – or any asymmetrical shawl – probably more than we were even able to show here! If you have your own way, please hop over to the Moogly Facebook page and share! But first you need something to wear in that photo – so let’s get to the pattern! Wrap St – (2 dc cluster wrapped around the last 2 sts): *Yo and placing hook in front of previous 2 sts, yo with working yarn held behind previous 2 sts, pull loop up to left of previous 2 sts, yo and pull through 2 loops on hook. (2 sts remain on hook) Repeat from *, end with 3 loops remaining on hook. Yo and pull through all 3 loops. 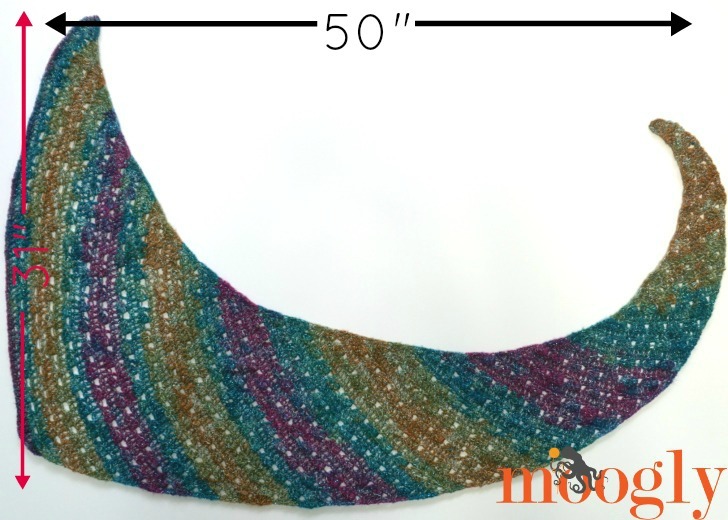 If you prefer a larger shawl, you will need to purchase an additional skein of Shawl in a Ball, but you can just continue with the 4 row repeats until you get the size desired. If you do not like the Chainless Starting Double Crochet (abbreviated CSDC), you can substitute a ch 3 for the stitch. The “Ch 2, skip the first st, dc in the next st” at the beginning of each even numbered row act as a dc2tog – do not crochet into the top of the ch 2 on the odd numbered rows. Row 10 – 77 (or to size desired): Repeat Rows 6 – 9, with the stitch count increasing by 1 for each row. Row 78: Ch 1, sc in each st across; break yarn and weave in ends. Lightly block if needed. Easy as can be! I loved seeing all these wonderful designers try on one of my designs fresh off the hook – such an honor! 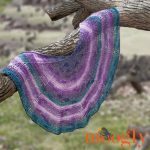 It’s often hard for us to get in front of the camera, and it was so great of them all to agree to model the Tango Shawl. 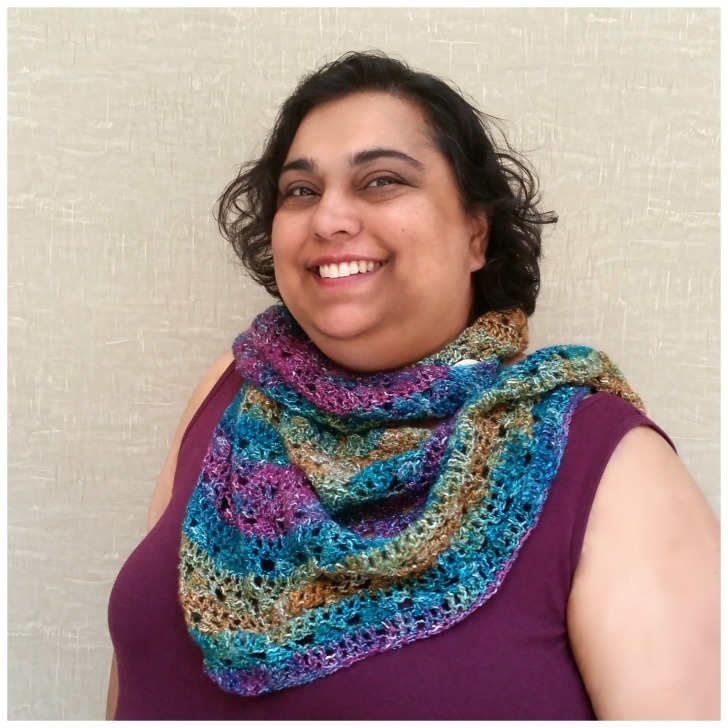 And I hope you enjoy crocheting the Tango Shawl! I can’t wait to see what all of you do with the pattern too! 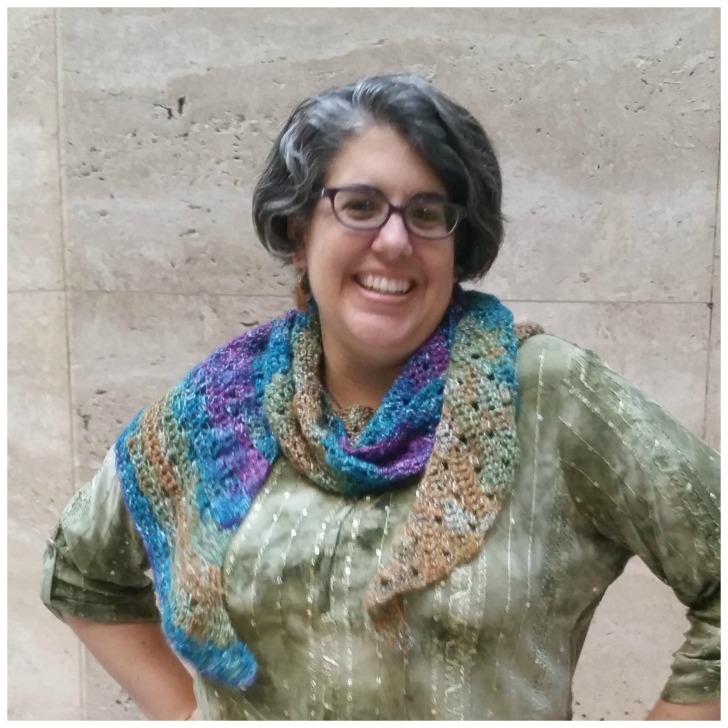 Looking for other patterns that use Lion Brand Shawl in a Ball? 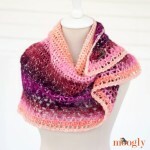 Check out these freebies: Lotus Blossom Shawl, Winged Wrap, Amara Shawl, and the Amelia Shawl! Written pattern copyright Tamara Kelly 2017, all rights reserved. Please do not reprint or repost this pattern, but please do link to this page to share this pattern with others. To print or download, use the Print Friendly button below, or go to PrintFriendly.com, or right click to copy and paste it into a word processing document if those options do not work for you (please note that Print Friendly is a free outside website that the button links to, and you can click here for a tutorial on how to use it, but I cannot provide additional technical support for this service). 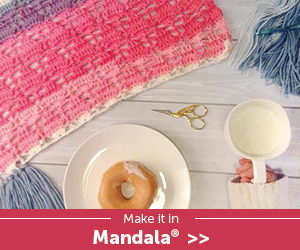 If you wish to make items for sale from this pattern or translate it to another language, please visit the About page for details. Thank you to Lion Brand Yarn for providing the yarn for this pattern, and thank you to all the designers for being such great models! Gorgeous! Thanks for sharing. 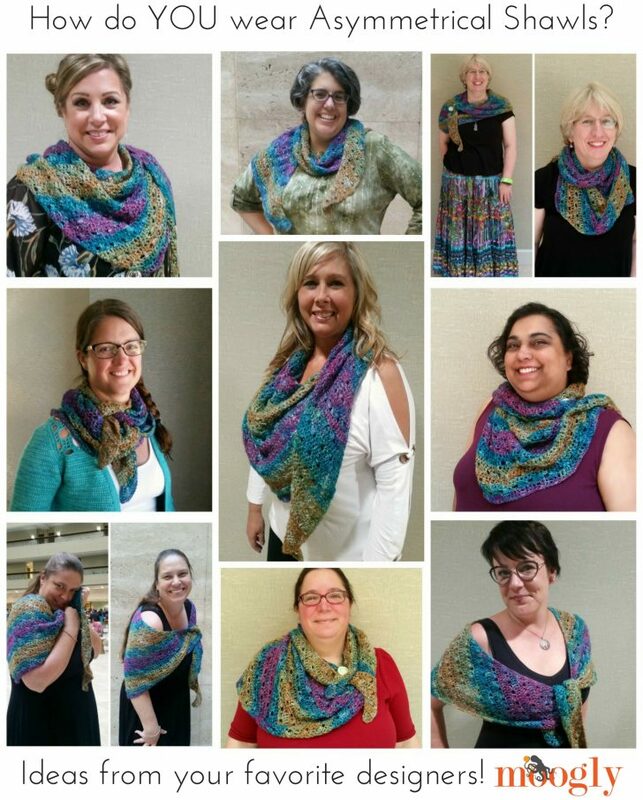 And all the lovely ladies featured here look so nice in their shawls! I love all the pics of them! 😀 Thank you so much Kris! I was so honored they all agreed to model for me! 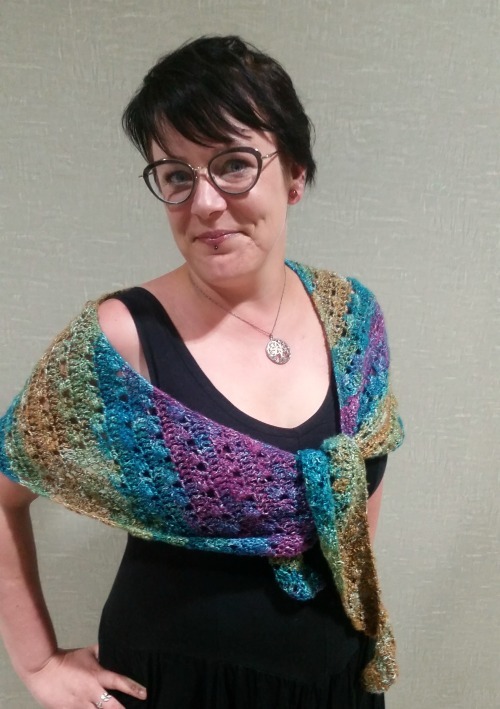 Love the finished product — the shawl,……..the colouration of ‘yarn gives “weight” to an otherwise skinny piece (one half), and ‘just love the jeweltones: ). ………the “girls” are great models and look happy…….ALL of ’em! …..’like your directions ‘n description — all-around, ‘am so pleased you shared this! Can’t wait to yarn-shop tomorrow (for similar tones) and get at it! Hi I found it with joy , saw this on Instagram and looked ofr it and came to qeo g place ro findIt?… But finally fot ir!…. thanks !. 🙂 I’m so glad you like it, thank you! Thanks for a lovely pattern beautifully modeled. Would it be possible for you to do a Video to show the first 8 or 10 rows. I have looked up the videos on CSDC and the Wrapped Stitches but am still having a little trouble getting started. Hi Lesley! I’ll add it to my schedule for sure! Thank you Tamara.. Looking forward to the Video. A great post Tamara, interesting to meet the other designers. It’s a stunning shawl, thank you for the free pattern. Another gorgeous pattern! Should be no surprise though. Could you recommend a substitute for the yarn? I love the look of the shawls you have made with it but it is not available locally for me to see and touch. I have read lots of negative reviews on the quality of ‘shawl in a ball’ so I am wary of ordering it online. I absolutely love your patterns and have used many of them . Thanks so much for sharing them. Hi Connie! Thank you so much! Hm, that’s a tough one, it’s a pretty unique yarn. Perhaps Landscapes, or Color Waves? Both will require more than one skein though. 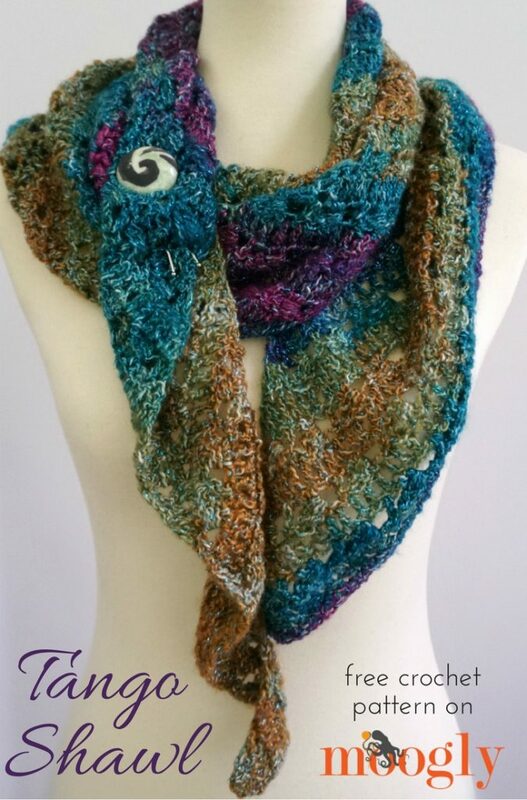 I think the shawl is stunning! I’m having a hard time understanding the first few rows of the pattern. Do the CSDC stitches count as a stitch? Hi Tamara, I’m just starting this wonnderful shawl. When I do the 2nd row, I’ve got 5 stitches, including the CDSC, rather than 4. Any thoughts as to what I might be doing wrong? Can you please let me know if you upload the video? Hi Sylvia! I can’t send out individual emails, but if you follow Moogly on social media or subscribe to the newsletter you’ll get the link within a week of it going live! Hi Barb! Thank you for the feedback, I’ve got it on the schedule for early next month! And another! Mine looks like a holey mess! Lol! Barring any additional tech issues, the video tutorial will be up on November 14! 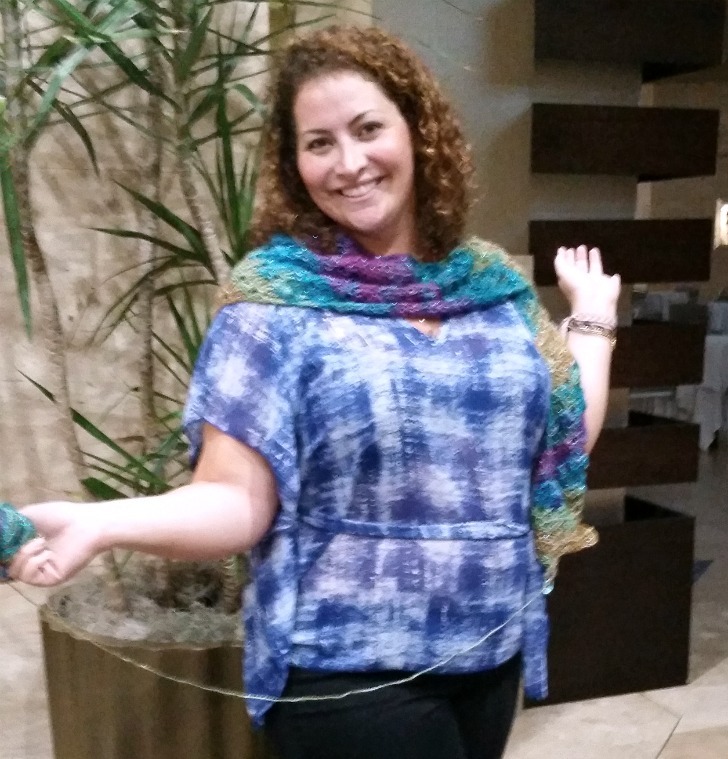 Thanks a lot, Tamara for showing the different ways to wear an asymmetrical shawl! 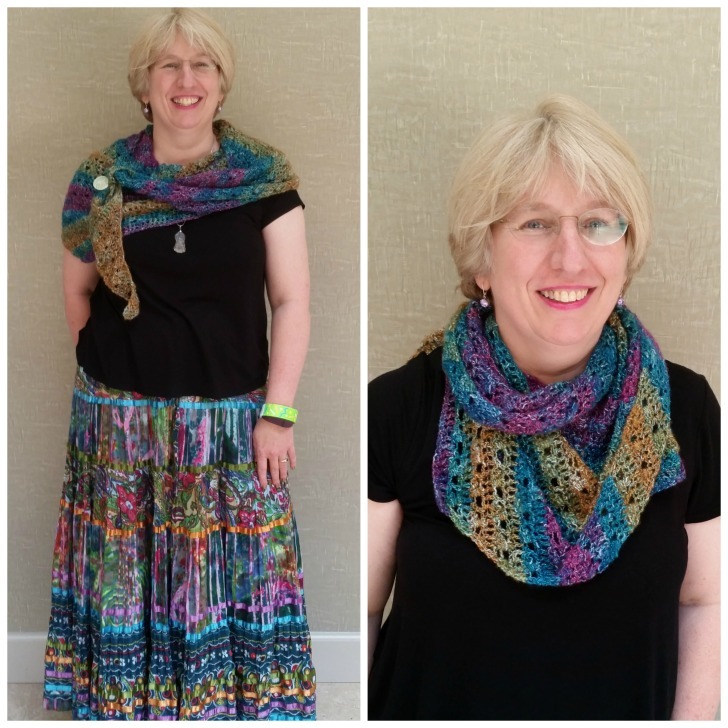 This is one of my favorite posts of yours because it shows and ids other crochet bloggers, and your work with different options to wear it. The only other blogger I follow is Kathy from Elk Studios at this point. I’ll need to check out the other bloggers and increase my time to crochet to take it to the next level. I hope the trip was a great time. I’m so glad to hear it Marilou – I was just lucky enough to be in the right place at the right time for this one! 😀 It was so much fun, I hope you can join us someday! I have crocheted row 6 3 times now but after the wrap st I have 2 stitches left. So when I’ve done the wrap stitch I do a dc in the next st and 3 dc in the last stitch. That makes 8 st, but no ‘rep from * until 1 st remains.’ Am I doing something wrong? And when I look at the picture with the measurements I see one hole in row 6, so only one wrap stitch. Sounds like you have it correct! The rep from comes into play on the repeats beginning in Row 10. I thought of the row 6 – 9 repeat when I was lying in bed last night. (Time difference is 7 hours. Almost time to go to sleep again…). But it’s better to be safe than sorry. Thank you! 😀 I understand! Sleep well! I’m making the shawl as a going away present for a colleague of mine. Or I might keep it for myself. Nooo. I can always make another one. I am good with the repeat part of the instructions but am confused by the “8 stitches” part. Do you not count something ie the chain 2 maybe since we don’t crochet into iron the next row? 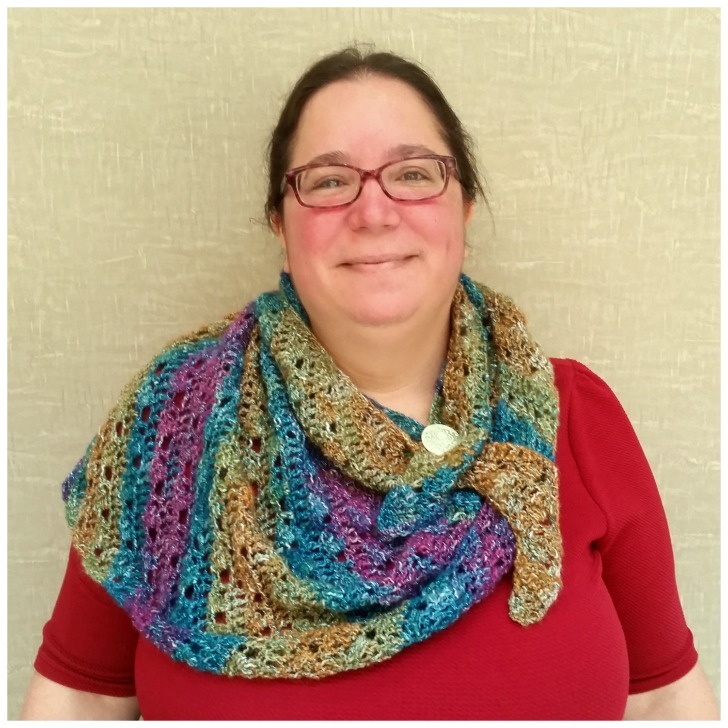 Hi Tamara, I love this shawl! Thanks for sharing the pattern. Quick question about the instructions – where you indicate # of stitches at end your of the first 9 rows, is this how many stitches you have done or how many stitches for the next row? This may be a dumb question but referring to Albertine’s question above and row 6, you list 9 stitches but the end count is 8, is there something that is not being counted ie the chain 2, since we do not work into on next row? Hi Dawn! The stitch count at the end of the row indicates how many stitches were made in that row. The “Ch 2, skip the first st, dc in the next st” at the beginning of each even numbered row act as a dc2tog – do not crochet into (or count as a stitch) the top of the ch 2 on the odd numbered rows. Been checking in all day today and no tutorial. I read above should be on the 14th. . Hope to make up a couple of these for Christmas gifts. if I can get to see the tutorial soon. I’m sorry Darlene, we had a technical snafu uploading the videos to youtube as they are so very long. Barring further issues it will be up tomorrow. I apologize for the delay. Love your patterns, thank you for sharing. I would like to know where I can purchase the pins/stick pins used like a broach to fasten the shawl. Oh wow, I love these . Thank you . I already put some in my cart now have to decide which ones I like best. 😀 You’re so welcome! I hope you enjoy using them! I have had this pattern for several years and finally just say down yesterday with one shawl in a cake. I am struggling to get the rows to come out right after row 3.